Beautiful Historic 5 BR / 2.5 Bath Harlem Brownstone For Rent!!! This is a beautiful, huge house that you will have all to yourself during your stay in NYC. The space you are renting is three stories with the living room, dining room, fully stocked kitchen, private deck and half bath on the first floor. There is a large TV with cable and a Blue-ray DVD player in the living room for your enjoyment. The Second Floor contains 2 large bedrooms, a laundry room, smaller third bedroom and a full bathroom with a glass stall shower. The Third Floor contains 2 more big bedrooms connected by a huge full bathroom with a double vanity and bathtub/shower. The bedrooms sleep 9 people and there is a Queen pull-out sofa, a twin trundle bed and twin air mattress so can hold a maximum of 13 people. There is a security system and free WiFi for use during your stay. I grew up in Ohio but moved to New York 14 years ago to attend graduate school and fell in love with the energy and history of the city. I purchased my 108 year old Harlem Brownstone 7 years ago and spent several years renovating it into its present beautiful condition. I love this neighborhood and have many dear friends who live on the block. I really hope that the guests who stay in the house can experience all of the wonderful things about Harlem and New York City while relaxing in their own private NYC Brownstone! I personally love to take my dogs to central park, travel, read and spend time with family and friends enjoying NYC!!! There are very few large historic homes left in NYC. 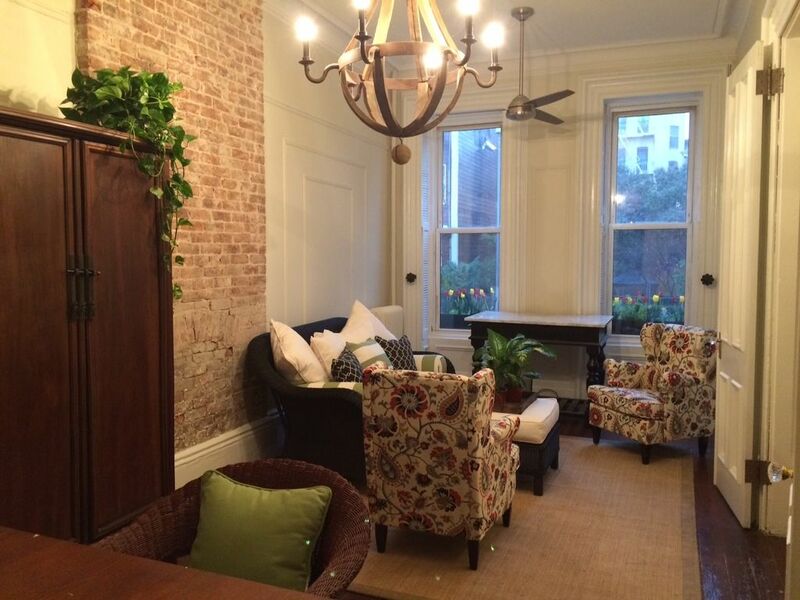 Staying in this authentic NYC Brownstone Townhouse is a very exciting and rare experience! From original marble fireplace mantels, to the mahogany staircase, to the original pocket doors and floors, the house is one of the very few in NYC with original details! Rented this home for a 6 person women's getaway - it was great. The kitchen had everything we needed and the house is just lovely. The location is within walking distance to Sylvia's and the Red Rooster (yum) as well as buses and the subway. Great house, great location - I will be coming back!